The Doctor and Sarah are drawn off course and, instead of UNIT HQ, they arrive on the same site in 1911. Doctor Who Episodes or stories I have seen, from 1963: first. to present day: downwards. Sarah Jane Smith: Whoa, I KNOW you're a Time Lord. The Doctor: You don't understand the implications. I'm not a hunan being. I walk in Eternity. Contender for best Doctor Who story ever - dark, thrilling and astonishingly high quality in all aspects! One of the finest Doctor Who stories of all time without doubt, this is pure genius throughout. An Egyptologist, Marcus Scarman, enters an Egyptian tomb in 1911 and is taken over by a powerful being. This being, Sutekh was a God to the ancient Egyptians but it is later revealed that the Egyptian Gods including Sutekh and his brother Horus were actually ultra-powerful alien beings called Osirans. Sutekh is evil and exceptionally powerful. He wants to destroy all intelligent life he considers a threat and he was imprisoned thousands of years before by Horus and hundreds of other 'Gods' who united their powers to defeat him. Sutekh now begins to use Scarman to enable him to finally escape. The Doctor and Sarah arrive in 1911 England where Scarman is returning to his home. They must stop Sutekh or the Earth and many other worlds face destruction. Sutekh is one of the best villains in Doctor Who. The power and evil shown by him is scarily impressive, The Doctor appears genuinely in fear of him and so is the audience. The sinister realisation of Sutekh himself is brilliant and Gabriel Woolf plays the part incredibly effectively. Those in his power also carry out some tremendously scary and effective scenes of evil. There are too many magnificent scenes to mention in this story and the effects are extremely well done, adding to the impact of many scenes. Just one great example is the smoke emitting from boots and gloves of a creepy black-clad villain as he kills a servant no longer considered useful. The story itself is genius and the dialogue is marvellous, with so much intelligence and interest imbued in every scene. The acting matches the quality of the material with every main part being played perfectly. Michael Sheard as Laurence Scarman is a particularly interesting, endearing and wonderfully acted part whilst that character is also used to bring out some great insight into The Doctor himself. The dark side of The Doctor is explored fully in this story and light is shed on how he balances care for individuals with an ability to weigh up the 'bigger picture' of what is at stake. There are superb character based scenes across all 4 episodes. 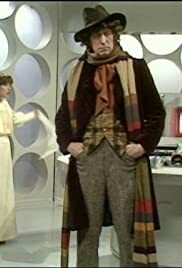 There is also a chilling and imagination capturing scene when The Doctor goes forward to 1980 to show Sarah what the Earth will be like if they left without stopping Sutekh. This scene is to prove that Sarah's knowledge (and the audiences) that the world was not destroyed in 1911 is based on facts that can change depending on their actions or lack of action. A scene of massive importance in bedding the whole series in some logical context. Another incredibly good aspect in this story is the exposition. Never in any TV show have motives, actions and events been so effectively and intelligently explained whilst still keeping you entirely captured within the drama. Tom Baker and Elisabeth Sladen are perfection and the whole adventure is enthralling in every way. This is a real front-runner to be the best story of all time and it is set within series 13, a contender for best series ever.